Tell us and win it! Just comment with your idea – What would you make with 10 Beautiful skeins of Supermerino in skeins in all shades of purple, from pale lavender to iris! Register and comment, or share this post on facebook, twitter or google plus, and you’ll be entered to win it. Contest ends April 30th! 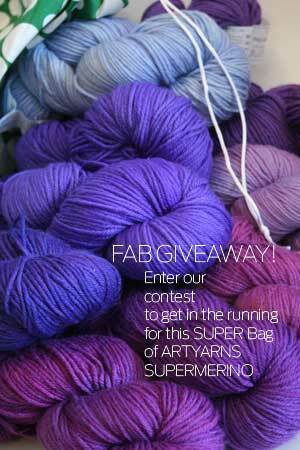 Artyarns FB Color – Special Edition Available Now! A center-out afghan, or maybe a swirl jacket. I would share them with my sister’s so I could teach them how to knit a nice modern looking shawl. Maybe a Westknits design. 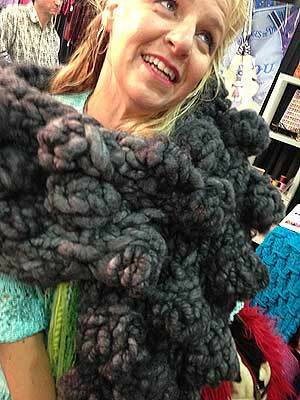 I think everyone should learn on natural fiber yarns if they have the opportunity! We’re all students, so this would help a lot! My first choice project will be a jacket. I love Merino Cloud Kaleidoscope shawl and Florentine Shawl in VIOLA too. I will make the best use of all yarns so that I have double blessings not just one project. By the way, my favourite color happens to be PURPLE, I LOVE PURPLE. I’d have fun playing with color for some beautiful shawls and fingerless mitts. I would make make shawls for my family and some older ladies at church. I’d make lap blankets for my two daughters. Gorgeous yarn! Leslie! Your are the winner1 just wanted to let you know before we announce it! It reminds me of thistles or irises so either a lacy shawl full of floral influence or a cardigan like this:http://www.ravelry.com/patterns/library/winter-weeds-cardigan. I’d knit hats and fingerless gloves for my six beautiful nieces. They’d all be color coordinated!! I will knit up how far all my Purple yarns provide, Patterns from Iris’s collection …oH! so many choices to drool over and over. I’d make something gradient for sure – shawls or an afaghan. I would love to bury my face in all those delightful shades of purple…so a big floppy Cowl come Shawl! Those colors are stunning! I would make a big, cabled rectangular poncho. I would make a gorgeous purple throw and display it in my house. Would make a large shawl using the Swing Knitting technique with German short rows. Work on granny squares with m 9 year old daughter so we could Mae a blanket together! A cardigan if I have enough! If not, probably a beautiful shawl as a wedding gift for my sister. I’m not sure what I would make, but it would surely be lovely if made from this yarn. Would make gloves, mittens, scarves, hats and add my alpaca yarn made from the fiber of are animals; graded and sorted to be the finest. I would make a sweater and a hat for my daughter, a shawl for me and a hat for DH. In this order. It would be lovely! I would find a shawl pattern which would make dramatic use of the beautiful shades of purple. So lovely! I would make shawls or cowls for my daughters & granddaughters. How nice this would be!! I would probably make some small luxury items for me, my mom and sister…maybe some cowls or hats. I’d crochet more blankets for preemies!! Little spring hoodies (or maybe a Lennox sweater, who can decide?) for my two sweet little munchkins if there is enough…if not, they will have to share!! The Winner is HERE! Congrats Leslie Angerer! I would make a big, luxurious shawl using two strands together.